If at first you don't succeed..., originally uploaded by indiaeden. ... This will be the Zimmermann February Baby Sweater, it may not be completed until this baby is 21,but I'm not gonna give up, however tempting it might be! I've got as far as 4" into this, and each time managed to mess up and have to start again. I just can't see why I'm messing up,it's a simple pattern,yet my brain just wanders off and one wrong stitch here or there and the whole pattern is off. I try frogging back to the mistake,but each time get more confused and end up ripping out the whole thing in frustration! 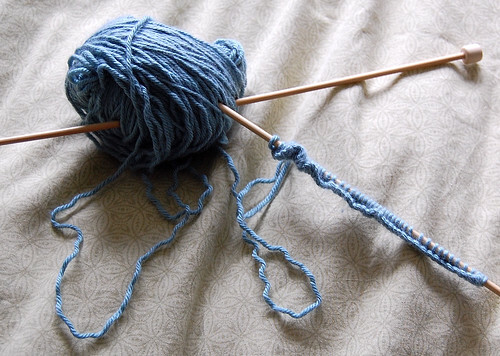 I think I've said before how I'm simply not a natural knitter. oh Caroline, thanks for that link, that is gorgeous! Now to get my hands on the pattern. If you lived anywhere nearer me, I'd be happy to lend you my machine, as it is it's just gathering dust! Bless you re the sewing machine, I really do feel quite bereft about it.